Daughter of a baker, she was raised in a family of craftsmen and tradesmen, and was related on her mother's side to the noble Barbon de la Bourdaisière family. A pious and sometimes mystical child, she would memorize and recite homilies, and early wanted to become a nun. Against her wishes, she entered an arranged marriage with Claude Martin, a silk manufacturer, at age seventeen, and was soon the mother of one son. Widowed after two years of marriage, she moved back with her family, and refused to discuss re-marriage. Worked as an embroiderer. On 25 March 1620 she experienced a vision in which she was shown all her faults and human frailties, then was immersed in Christ's blood. This event changed her completely, and her desire to be involved in religious life translated to prayer, liturgical devotion, and charity. Finally leaving her father's house, Marie worked as a bookkeeper in her brother-in-law's shipping company. Having a gift for administration, Marie was soon the company manager. However, the drive to the religious life never ended, and in January 1631 she asked her sister to care for her son Claude, and then joined the Ursulines at Tours, France on 25 January 1631. Claude gathered a group of his friends, all 12 or 13 years old, and tried to storm the convent to "free" his mother, but they were unable to gain entry. This incident has been often cited by her detractors as indicative of a serious flaw in Marie, and even she did not wholly understand why she did what she did. She later explained, however, that she was following God's will, and Claude apparently came to understand it - he became a Benedictine priest in 1641, the assistant to his Order's superior general, and his mother's biographer. Marie took her final vows in 1633 as Marie de l'Incarnation. Assistant mistress of novices for the Order in Tours. Doctrinal instructor. After a few years of this work, Marie received another vision that would change her life. This time it was a huge country of mountains and forests, and the message that it was Canada, and that she must go there to build a house for Christ. She worked for years to collect the money and support for her mission, and in 3 April 1639 she sailed from Dieppe with Marie-Madeleine de la Peltrie, one of her primary supporters. She landed in New France on 4 July 1639, and arrived in the future Québec, Canada on 1 August 1639. She was the first superior of the Ursulines in Canada. Worked as a missionary to the Natives and other residents in the area. Studied the local languages with the Jesuits who were already in the area; she became so proficient that she later wrote Algonquin, Iroquois, Montagnais, and Ouendat dictionaries, and a catechism in Iroquois. She laid the first stone of the convent in 1641, and took it over in 1642. It formed the base for her work, and when it burned on 29 December 1650, she supervised its reconstruction, finishing construction on 29 May 1651. Ever strong-willed, she opposed bishop Blessed Francis de Montmorency Laval's attempt to control the Quebec Ursulines. A prolific correspondent, over 12,000 of her letters have survived. Born to a middle class family. Studied at the seminary in Turin, Italy. Ordained in 1811. Parish priest in Bra and Corneliano d'Alba. Doctor of Divinity. Joined the Order of the Corpus Christi in Turin. Canon of the Church of the Trinity in Turin. For several years, Joseph treated his priesthood more as a career than a vocation. Then one night he was called to the bed of a poor, sick woman in labour. The woman badly needed medical help, but had been turned away everywhere for lack of money. Joseph stayed with her throughout the travail, and was there to hear her confession, give her absolution, Communion, and last rites. He baptized her newborn daughter, and then watched as both of them died in bed. The trauma of the evening changed his mind about his vocation. In 1827 he opened a small shelter for the area sick and homeless, renting a room, filling it with beds, and seeking male and female volunteers. The place expanded, and he received help from the Brothers of Saint Vincent and the Vincentian Sisters. During a cholera outbreak in 1831, the local police closed the hospice, fearing it was a source of the illness. In 1832, Giuseppe transferred his operation to the Valdocco area of Turin, Italy, and called the shelter the Little House of Divine Providence (Piccola Casa). The Casa began receiving support, and grew, adding asylums, orphanages, hospitals, schools, workshops, chapels, alms-house, and programs to help the poor, sick, and needy of all types. This small village of the poor depended almost entirely on alms, Joseph kept no records, and turned down offers of state assistance; never once did they do without. Joseph directed the operation until a few days before his death, and the Casa continues to today, serving 8,000 or more each day. He founded fourteen communities to serve the residents, including the Daughters of Compassion, Daughters of the Good Shepherd, Hermits of the Holy Rosary, and Priests of the Holy Trinity. Born to impoverished Italian nobility, the son of Paolo Ghislieri and Domenica Augeria. Worked as a shepherd as a boy. Received an excellent training in piety and holiness, including a scholastic education from a Dominican friar; he joined the Order himself in 1518, taking the name Michele. Studied in Bologna, Italy. Ordained in 1528 in the diocese of Genoa, Italy. Teacher of philosophy and divinity in Genoa. Professor of theology in Pavia, Italy for sixteen years. Master of novices and prior of several Dominican houses, working for stricter adherence to the Order's Rule. Inquisitor in Como and Bergamo, Italy. Commissary general of the Roman Inquisition in 1551. 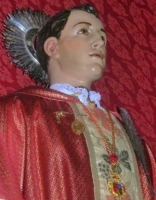 On 4 September 1556 Michele was consecrated Bishop of Nepi e Sutri, Italy against his will. Inquisitor in Milan and Lombardy in 1556. Created cardinal on 15 March 1557. Grand inquisitor on 14 December 1558. Part of the conclave of 1559 that elected Pope Pius IV. Bishop of Mondovi, Italy on 17 March 1560. As bishop, Michael worked to lead his flock with words and examples, and served as a continual messenger encouraging personal piety and devotion to God. Chosen 225th pope in 1566. 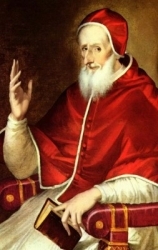 Upon his ascension to the papacy, Pius V immediately faced the task of enacting the reforms of the Council of Trent. New seminaries were opened, a new breviary, new missal, and new catechism were published; foundations were established to spread the Faith and preserve the doctrine of the Church. Pius spent much time personally working with the needy. He built hospitals and used the papal treasury to care for the poor. Pius faced many difficulties in the public forum, both in the implementation of the Tridentine reforms and in interaction with other heads of state. At the time of his death he was working on a Christian European alliance to break the power of the Islamic states. May have been related to royalty. Benedictine monk. Founded Chertsey Abbey in Surrey, England, and served as its first abbot. 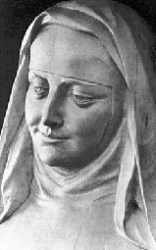 Founded a convent at Barking, Essex, England; his sister, Saint Ethelburga of Barking, served as its abbess. Appointed bishop of the East Saxons by Saint Theodore of Canterbury in 675; his see was in London. 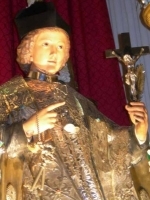 Suffered from severe gout, but continually travelled through his diocese. His shrine was a pilgrimage site in the Middle Ages, and the sick were miraculously cured by touching the chair he used for travel. Layman artison, trader and saddler at Verona, Italy. His reputation for sanctity spread, and the people of Verona saw him as a saint in their midst. He retired to become a Camoldolese Benedictine monk at San Salvatore priory near Verona. Lord of Vernon-sur-Seine. Norman knight in the First Crusade in 1095 during which he was captured by Muslims who tried to force him to abandon his faith. He escaped, apparently swimming to freedom, returned to France, and became a Benedictine monk at Tiron, France. 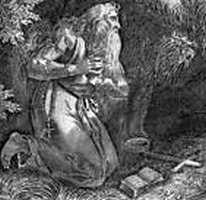 Hermit in his later years. Studied at the Shkodrë Pontifical Seminary, and in Innsbruck, Austria. Ordained in Primiz, Austria on 3 August 1919 as a priest of the archdiocese of Shkodrë-Pult, Albania. Imprisoned in 1947 during the Communist government’s anti–Christian persecutions, he survived months of torture. Martyr. Studied in Lithuania, at the English College at Douai, France, and the College of Saint Alban, Valladolid, Spain. Priest. Returned to England to minister to covert Catholics, mainly in Northumberland. Arrested while celebrating Mass, and condemned to death for the crime of priesthood. Martyr. Daughter of the Duke of Swabia, Germany. Married Emperor Charlemagne in 771. Empress. Mother of nine during her twelve years of married life. Friend and supporter of many monks and nuns including Saint Lioba of Bischofsheim. Founded Kempten abbey. Dominican priest. Arrested and executed in the persecutions of Emperor Tu-Duc, charged with spying when caught bringing communion to his sick mother. Martyr. Benedictine monk at Savigny, Normandy, France. He was believed to have leprosy, and so he was assigned to care for some brother monks who were dying of the disease. Later he was found not to have the condition, and was allowed to return to the general population of his house, but had already developed a ministry for caring for the sick. Priest. Mystic, given to ecstacies. Born wealthy. Joined the Benedictine Italian Cruciferi. Built an abbey and hospital on his family estate near Assisi, Italy, and served as its abbot the rest of his life. First bishop of Forli, Italy. Worked to convert pagans and suppress Arianism, which led to him being depicted in art as killing a dragon. Attended the Council of Rimini in 359. Priest. Friend and assistant to Saint Gaudentius of Novara. Martyred with a group of children he was instructing in Christianity. Missionary to Gaul (modern France), consecrated and sent by Pope Saint Clement I. There he worked with Saint Denis of Paris. Hermit. 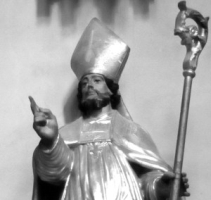 First Bishop of Saintes, France. Martyr. Friend of Saint Laviero. Deacon and courageous preacher in a time of persecution. Martyred in the persecutions of Diocletian. Priest. Bishop of Domhnach-Mor, Ireland, a diocese that no longer exists. Emigrated to Belgium, he helped found Waulsort Abbey, and became a monk there. Abbot in 962, establishing it as a Benedictine house. Layman. Murdered by Saracens for publicly proclaiming his faith. Martyr. Worked with missionaries to Germany. Bishop of Werden, Westphalia (in modern Germany). Ordained in Córdoba, Spain. Murdered by Saracens for publicly proclaiming his faith. Martyr. Late-4th-century bishop of Euraea in modern Albania. Reported to have killed a dragon by spitting in its mouth; this may be some sort of metaphor for defeating the devil by standing up for his faith. Priest martyred with about 30 of his parishioners whose names have not come down to us. Monk at Beaulieu, Limousin, Limoges. Martyr. Lay man merchant Christian in Ephesus. Beaten, racked and martyred in the persecutions of Decius. Consecrated virgin martyred in the persecutions of Decius. Brother of Saint Deiniol. Bishop of Bangor, Wales. Known for his ascetic life, there are several churches dedicated to him. 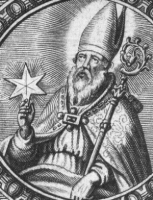 Bishop of Naples, Italy from 508 to 536. Fierce opponent of Arianism.